Training Tesseract for Ancient Greek OCR article published in The Eutypon 28-29. Use new Tesseract tools to generate training images. Sample characters at different exposure levels. Remove rare characters (†/ϙ/ʹ). Add speech marks (“/”). Replace accented characters in modern Greek unicode set (U+0370) with Ancient Greek (U+1F00) variants. Improve wordlists by properly registering upper / lower case complements. Improve wordlist generation from Perseus corpus. Improve punctuation rules. Add rules to convert some apostrophe detections into breathing marks. Build is completely deterministic. Significantly improve line segmentation. Improve diphthong breathing mark correction rules. Add noise to training texts to improve recognition for lower quality scans. Improve diphthong breathing mark correction rules. Improve accent ambiguity rules. Add several miscellaneous ambiguity rules. All of the code used to generate and test the Ancient Greek OCR training data is free software released under the Apache License 2.0. Rules and tools to deterministically generate the Ancient Greek training for Tesseract. 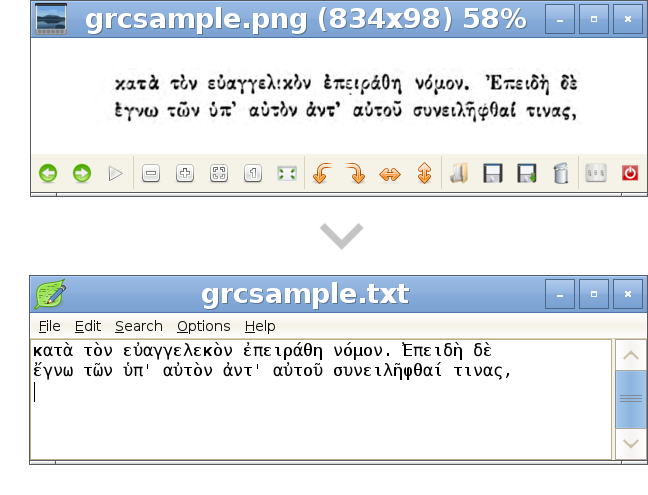 Ancient Greek page scans and ground truth text for testing OCR accuracy (note that this repository is about 4.5GiB). Tools to test OCR accuracy. There are several old repositories which are kept around in case they are useful to people, but have been superceded by the above repositories. The final training process, which used files generated by the grctraining repository. All of this functionality is now included in the grctraining repository. Ancient Greek page scans and ground truth text for testing OCR accuracy (far fewer than is now included in the grcground repository above). For comments, bugs, criticisms, code, help, or anything else, contact Nick White at ancientgreekocr@njw.name. This project was made possible in part by the Institute of Museum and Library Services, LG0611032611; the National Endowment for the Humanities: Exploring the human endeavor; and the Perseus Digital Library Project, as well as the ERC funded Living Poets Project. The Tesseract OCR engine makes this all possible, doing all of the hard work behind the scenes. Lace is a project publishing high quality OCR on scans of Ancient Greek from archive.org.